Based on my research it would seem that Y to X should have read 240 V, not 0. However, the other two connections are both reading 120 V correctly. I'm wondering what this would typically indicate - bad wiring? If so, what would be a good next step to either fix the issue or confirm the problem? Or at this point is it time to call an electrician? I bet if you go to your service panel, you're going to find a completely full service panel, and a unique creature we call a "double-stuff breaker". Quite likely the landlord does his own electrical work or pays a dumb handyman (naughty naughty). He's out of space in the panel, so he resorted to those double-stuffs. He moved the dryer from a 2-pole breaker (which takes 2 spaces) to a duplex breaker that takes only one space. As my link discusses, one space sees only one pole, so you get what you saw. Any proper electrician would notice a "red flag" where the duplex sides can turned off individually, making it unsafe for dryer use. Since this is a rental, you can't fix any of this. Most jurisdictions require commercial work be done only by licensed electricians, and rental properties are considered commercial. You can't, he can't, his handyman can't. A pro electrician is required. Given this level of incompetence, I would not advise trusting that circuit. The obsolete and dangerous 3-prong connections absolutely rely on the neutral wire being intact and not broken. If neutral breaks, the chassis of the dryer becomes electrified and can kill you, especially as you are handling wet things and touching both dryer (electrified) and washer (grounded). But since he must fix it, he should consider bringing in someone competent, and upgrading the circuit to modern, safe NEMA 14 standard. This will require you change the dryer plug (back to what it was shipped with), but will be much safer for your family. One possibility is that the two hots, labelled X and Y, are on the same line or leg of the service. The 240V electrical service typical in the US is a three wire Edison circuit, with two of the service wires, commonly called the legs or lines, designated L1 and L2, are at 240VAC at 60Hz, with the neutral tapped midway between the two - 120V L1 to N and 120V L2 to N - and the neutral is grounded. 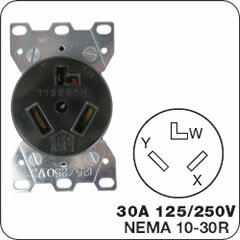 In your electrical panel, a 240V 2-pole breaker will attach to bus bars that are each in turn connected to L1 and L2. So the two poles of the breaker are at 240V. If the wires at that receptacle go back to a 240V breaker, properly installed in the panel, it would be very unusual to see anything but 240V at the receptacle. The 240V breaker straddles both legs, so one terminal is tied to L1, and the other is tied to L2. However if the wires for that receptacle are terminated on two breakers that are both on L1 or both on L2, you will see just what you're seeing. For example, if they used a tandem breaker - the space saver breaker that squeezes two breakers in a single space - you'll see just what you're seeing. Both of the breakers in a tandem tie to the same leg. There may be other possibilities, including something wrong in the wiring between the breaker and the receptacle. This happened to me a couple of years ago. The builder (in 1972) apparently found some three-phase load centers really cheap and used those in place of a more normal 240V panel. He then wired two of the phases to one leg of the 240V circuit, the third phase to the other leg. Instead of an ABABAB... pattern on the comb that the breakers plug into, the pattern was AABAAB..., so you had a i in 3 chance of placing a double (240V) breaker with both legs on the same leg of the 240V circuit. And of course, that's exactly what happened when the electrician installed the new dryer circuit a couple of years ago. Someone connected both X and Y to the same 110V side of the electrical service. The only fix is to move either the X or Y wire to it's proper location, attached to the other leg of the electrical service. If the wiring problem is in the circuit breaker panel, it's because he used two single pole breakers instead of 1 double pole breaker. If he had used the double pole breaker, it would have been impossible to wire wrong. You need to tell the landlord, and he'll need to get someone to fix it. If he won't fix it, you can actually modify the dryer to run on 110V. It's a simple change and should be documented in the installation instructions. The only problem is that everything will dry very slowly. Not the answer you're looking for? Browse other questions tagged electrical dryer 240v 120-240v or ask your own question. Why must I hold the start button for my dryer to work? What do the neutral and ground connectors in outlets connect to? How can I install a Miele Washer and Dryer that use a 240V/15A splitter? Does anyone know how to split the 240 V wire components of a dryer from the 120 V?